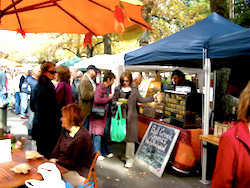 Every weekend, somewhere in the Adelaide Hills there is a farmers' market on the go. These markets can increase tourism and the circulation/retention of money within the local community, leading to local jobs and economic growth. A successful market is one with a shared goal for the event organisers and its stallholders. Local content and quality products are also key factors to developing a vibrant farmers' market. The event organisers are challenged by maintaining local content, ensuring the stallholders are aware of their legal requirements in terms of business registration, handling and storage of food, appropriate labelling and the safety for all concern. The stallholders are the life blood of a successful market. They need to be engaging and establish customer rapport. They also need to understand what they bring to a market without diminishing the efforts of other stallholders, rather they need to build a referral approach between customers and fellow stallholders. For many stallholders, the art of selling and marketing their business is new to them. This includes the use of social media to connect with customers between market days to promote upcoming specials; a belief that they need to cut prices to be competitive; not knowing the true cost of a sale and ability to capitalising on a niche product or service. A good market needs to be a "Win Win" situation for all involved. Customers need to leave satisfied and wanting to return, event organisers need to provide a platform for local farmers and producers to create a respectable income while showcasing their products to a much wider audience. Increase turnover with increased profits. Minimise risk to the stallholders businesses, event manager and customers. Create greater customer engagement to attract new customers and enhance repeat business. Encourage collaborative sharing of knowledge and suggestions. Building a referral network on market days. Better still it's delivered locally and very cost effective.